When Can Babies Eat Mango? How I wished I had you every day. Knowing very well that we miss you here. Not many fruits are as tempting as a mango. Kids, young and old, everyone likes it… but would your baby want to eat it? 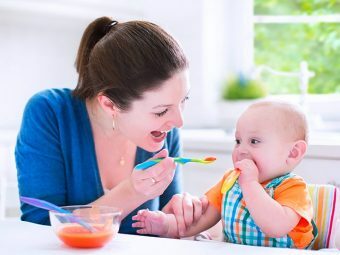 Most babies throw tantrums during feeding time, making mommies desperately search for alternatives. Mango can be your savior! The seasonal fruit is not only yummy but also packed with nutrients. 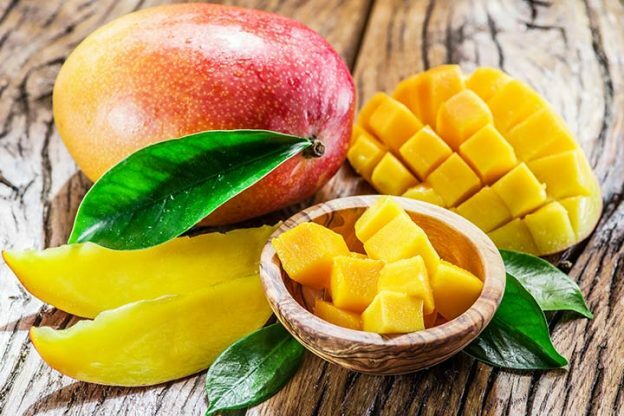 Read our post at MomJunction to find out the benefits of mango for baby and the right age to introduce them. Mango is one of the healthiest fruits you can offer your baby. It protects the eyesight, fights microbial infections, aids in brain development and is easily digestible. The fruit is low in both fat and calories. Digestion: The fruit contains biochemicals and enzymes like terpenes, esters, and aldehydes that help promote digestion. It is rich in fiber, and so helps in dealing with constipation (1). Eyesight: Ripe mango is the best source of vitamin A, which is needed by your baby for vision development. The fruit also has vitamins C and B, iron, potassium, and protein. Anti-microbial: Mango promotes epithelial function in the body and reduces the microbial attack. The chances of your baby developing a common cold, sinusitis and rhinitis will be lessened by if he consumes mangoes. This low acid fruit does not add to infant reflux. Immunity: Mangoes are rich in beta- carotene. Carotenoids help remove the free radicals from the body, helping boost the immunity levels. The fruit plays a significant role in preventing heart disease and cancer. Brain development: Eating mango improves brain functioning, as it is rich in vitamin B6. This fruit also contains glutamine acid that helps in improving the baby’s memory and concentration. The average recommended age to introduce mangoes to babies is in between 8 and 10 months. Some offer mangoes to babies as young as six months, without any trouble. It is, however, advisable to consult a doctor before adding any new food to your baby’s diet. Generalities may not apply to your little one. But, by following certain tips, you can definitely make him relish the fruit. 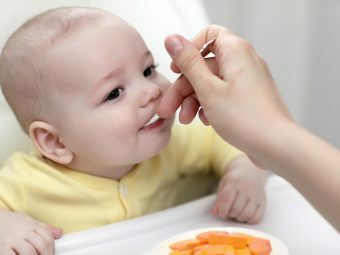 Feed your baby mango if she is already on solid and semi-solid food. Ensure that the mango is thoroughly mashed and is devoid of any fiber. Fibers in the mango can make swallowing difficult for your baby. Unripe mangoes are sour and are not easily digestible by babies. Check if your little one is showing allergies to mangoes. As mangoes are tropical fruits, they tend to be allergenic to young babies. Thus, they do not make a great first food. Pediatricians suggest to wait until eight months of age to offer any tropical food. The allergic reactions are rare and are not lethal. They are typically dermatological or topical. If the baby has an atopic reaction to mango, he may have a rash around the mouth or the bottom. The rash looks like that of a poison ivy. The allergen resides in the skin of the mango rather than inside. Rashes develop if an allergic person comes in contact with mango skin or sap. Eating mango pulp may not provoke a rash, but it is seen if the oleoresin from the peel touches the meat. If your family has a history of allergy to mango or nuts, take care while serving the fruit to your baby. Also, the high fiber content in mango may lead to diarrhea if the baby’s digestive system is not matured enough. Once you ensure that your baby has no allergies for mango, you may go ahead and feed him. But can you give him just any mango, stored at a wrong place in unsuitable conditions? How To Select And Store Mangoes? Mangoes are not among the dirty dozen foods contaminated by pesticides, according to the EWG. Select from many available mango varieties. The types vary in shape, size, taste, and texture. Unripe mangoes are sour, and the sourness disappears as the fruits ripen. Ripe mangoes are sweet in flavor. Mangoes having fiber-filled flesh develop into juicy fruits, while those with hard flesh develop into soft fruits. Pick a mango that is soft and gives out a nice aroma. Select the one with no signs of bruises, nicks, blemishes or cuts. The skin should have a uniform color and can have a few brown dots. Mangoes can be yellow-orange or reddish-orange or green. Test for firmness by squeezing the mango. If it is soft, then it is ripe! Note: Store ripe mangoes in the refrigerator for 4 to 5 days. Do not store unripe mangoes in the refrigerator. You may ripen them by popping them in a paper bag. 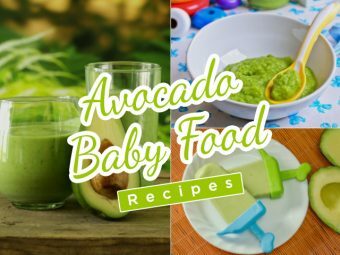 How To Make Mango Baby Food? Wash mangoes thoroughly with a mixture of water and vinegar (3:1) to remove bacteria. Rinse the fruit under running water and dry. Cut the mango lengthwise, along both the sides of the pit. Then cut the ends of the pit. Cut the remaining flesh from the pit. Or peel off the skin and cut the mango flesh into cubes. You can also make cubes, by cutting in a pattern even before removing the skin. It is an easy way to slice away the pieces. You need not cook a ripe mango for your baby. Mangoes can be pureed or cut into small pieces and served as finger food. If you are serving ripe mango puree to a six-month or seven-month baby, allow it to steam for a few minutes for it to break down. Peel the fruit and take out its pulp in a bowl. Mash the pulp using a fork or grate it to get the soft pulp. Feed this mashed pulp to your baby using a small spoon. One mango yields around six ounces of puree. Try mixing mango puree with banana, turkey, sweet potatoes, butternut squash, pear, applesauce, oatmeal, etc. Refrigerate the leftover mango puree for up to three days in BPA-free containers. Add carrots and mango into a cooker and pour half cup water. Cook for 10 minutes. Mash the contents with a spoon after it cools down. Mash mango dices until smooth. Add yogurt, and juice to get the desired consistency. Add in all the ingredients into a bowl and mash them together. Add a little water to achieve desired consistency. Note: You may add a cereal or grain to this recipe. The mix goes well even with pork or chicken. Other fruits that are good to go with mangoes are melons, blueberries, and avocado. Add all the ingredients into a blender and blend for two minutes. If desired, add a few ice cubes and the mango juice for babies is ready. Note: By adding a little water and milk to mango slices and blending it well, you can prepare mango smoothie for a baby. Blend in the ingredients thoroughly in a food processor. Place the mixture in the freezer until chill. Blend mango flesh, yogurt, turmeric, and chicken stock in a food processor. Transfer the ingredients to a saucepan and warm. Top with cooked chicken pieces and mix well. Note: You may serve it with cous cous or brown rice. Blend the ingredients together until smooth. Transfer the mixture to popsicle molds and freeze. Add rice, vanilla extract and milk to a saucepan and boil. Cook for 25 minutes in simmer. Keep stirring occasionally. Add mango slices and cook for a few more minutes. Remove from heat. Add banana mash after the dish gets cooled. Peel and chop mangoes in pieces and transfer to a saucepan. Add water and cook on medium flame for 10 minutes. Add in cardamom powder and saffron. Cook for five more minutes. Cool and puree with water. Peel the fresh ripe mango and remove the seed. Cut into little pieces, transfer all the ingredients into a blender and make a smoothie. Transfer the puree to ice lolly molds and freeze for four hours. Add sugar and custard powder to boiled milk and keep stirring. As the milk thickens, turn off the flame. After the mixture gets cooled down, add chopped fruits and refrigerate to cool the mixture. The fruit contains a lot of nutrients for your baby. Once your baby is ready for it, let him enjoy the goodness of mango. Q. What are the benefits of mango butter for babies? A. Mango butter comes from the seeds of the mango. The seeds are rich in fatty acids, which are beneficial for both the baby and the mom. Applying mango butter on the baby’s skin helps in nourishing and protecting the baby’s skin. Use a little mango butter to reduce the cradle cap and diaper rash. Moms can use mango butter that is rich in anti-oxidant properties to reduce stretch marks. Q. 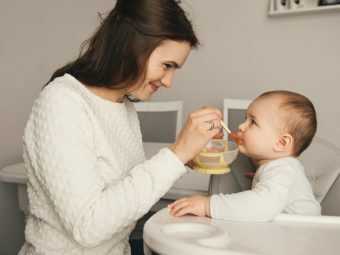 Can my baby eat dried mango? A. Dried mango serves as a great candy for babies who can chew well. It can help ease the irritation for a teething baby. Be careful as it may pose choking hazard to the little one. If you want to share some more mango baby food recipes with our readers, please write in the comments section below. 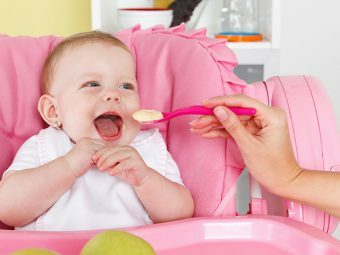 How And When Should You Introduce Solid Foods To Your Baby?